The wonderful, perverse, and slightly off new surreal comedy about, among other things, exploitation of workers, racism, and performance art, is a more intelligent alternative movie on the African American experience than the wildly popular Black Panther. And it's far more unexpected. A black superhero was inevitable. Who would expect a black, mainstream critique of modern capitalism, union organizing, race as performance, worker solidarity, media exploitation and humiliation? This too is set in Oakland, California. But though fantastic, it's more real. Boots Riley's new movie contains a multiplicity of valuable messages. But its color, charm and invention are impossible to convey, you just have to see and enjoy it. 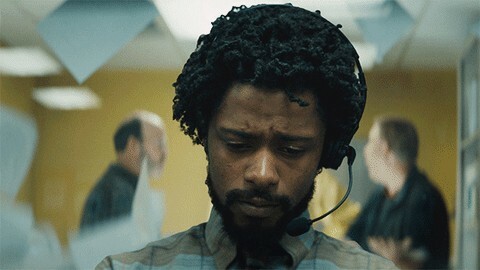 The hero, Cassius (Cash) Green (the appealing and relaxed Lakeith Stanfield of "Atlanta"), an innocent, lovable black everyman, owes four months rent on his uncle's garage that he's living in with is girlfriend, and will do anything for money, utterly humiliating himself if necessary. He learns better, by going to work at a RegalView Telemarketing, where the main mantra is "Stick to the script," hence the movie title, the opener to customers. He uses outrageous fake objects, a work honor and a huge sports trophy, to recommend himself, which the interviewer sees through at once, but hires him anyway. For this job, there are no criteria except to have a pulse and sell the products! Cash's sellout is dramatized by contrasting him with his true-blue girlfriend Detroit (Tessa Thompson), a performance artist who in the course of the movie becomes successful (the whole film is about transformation, in shockingly blatant ways), but at the outset is waving around big signs on ghetto streets for pennies (which is all Cash can afford to fuel up his rust-bucket car on the way to his interview). Detroit sees and points out Cash's betrayals of himself. Meanwhile, the low level telemarketers, led by Asian fellow worker Squeeze (	Steven Yeun) are on strike demanding to get paid and organizing a union. This movie blends bouyant good humor with absurdity and truth. Employees at RegalView Telemarketing keep getting promised a pie-in-the-sky golden job as a "Power Caller," literally on a higher level, if they do well. It sounds like pie-in-the-sky but it turns out to be true. Cash gets promoted to it, and finds himself selling a literal system of slavery called "WorryFree," where workers live and work in a thinly disguised prison in exchange for free food and lodging, no salary. WorryFree is the product and property of an urbane Silicon-Valley-type superman billionaire, Steve Lift (Armie Hammer). Cash has turned out to be the second best salesman RegalView Telemarketing has ever had, so he comes in direct contact with Steve Lift. Cash has moves to a world of dress-up, elaborate security key-pad codes just to use the elevator, and abundant champagne. He and Detroit have moved into a nice, bright apartment with a view of downtown Oakland. But Detroit knows he's selling his soul and turns away from him - while at the same time her art career is taking a leap forward with a big who, featuring reimagined maps of Africa. Cash doesn't pull away and become himself again till he sees how dire the scheme for its human workers Steve Lift and WorryFree's plans really are. 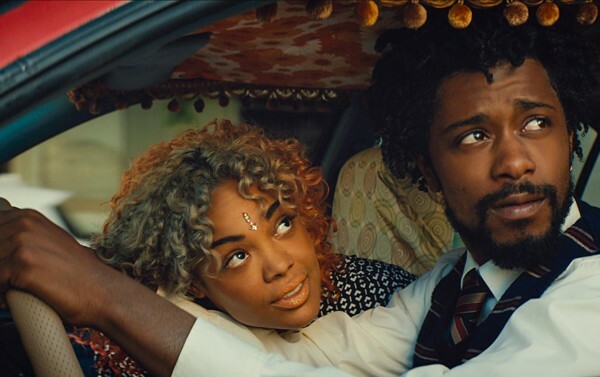 Sorry to Bother You is fun, and surprising. Like a true satire, its jagged plot line arouses laughter while points to truths. Beats are missed. It may not all make sense. But it's as thought-provoking as it is fun. Let's hope people see it, and get it. 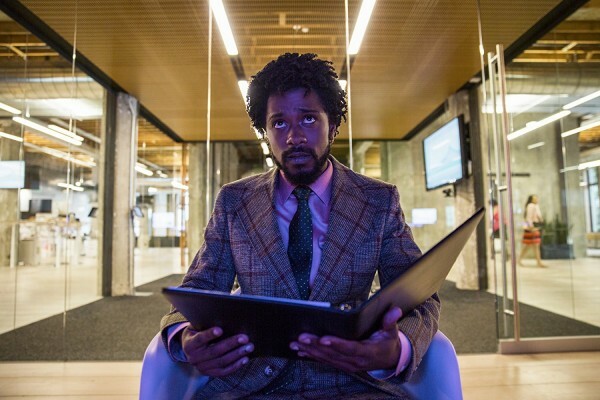 Sorry to Bother You, 105 mins., debuted at Sundance Jan. 2018 and showed also at SXSW, Seattle, San Francisco, and BAMCinemaFest. It opened in US theaters 6 Jun. 2018. Metascore 79%.